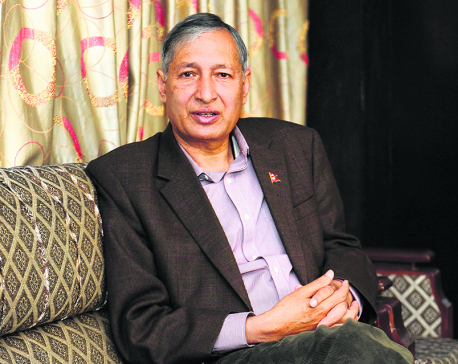 KATHMANDU, March 18: Finance Minister Dr Yuba Raj Khatiwada has said that the social security program would be kept under a single umbrella. Addressing the 29th-anniversary program and foundation-laying ceremony of the new building of the Citizen Investment Trust (CIT) here today, he said the various government bodies and agencies operating the social security program would be run in an integrated way. "All works from the identity card related to the social security to distributing the social security allowance would be run in an integrated manner by bringing the entire social security programs under a single umbrella-like in other countries," the Finance Minister said, adding that the institutions working in the social security sector would be integrated within five years. Minister Khatiwada said that since CIT is an integral part of the social security program, it should move ahead hand in hand with the government. He stressed on making CIT a strong basis of the financial market, and that new laws are being formulated to make it more autonomous and transparent. The Minister suggested that CIT support those wanting to raise capital from individual capital market and the stock market. Nepal Rastra Bank (NRB)'s acting governor Chintamani Shivakoti said preparations were afoot to conduct inspection and supervision of institutions like CIT and the Employees Provident Fund. CIT chairman Prof Dr Ram Chandra Bhattarai said that the Trust would invest in the productive sectors like energy, agriculture, tourism and physical infrastructure. CIT executive director Raman Nepal said a study is underway to involve the independent workers and farmers in the unorganized sector and he self-employed industrialists and businessmen in the various programs brought by the CIT. The CIT currently has 631,919 depositors from more than 4,800 offices under its 11 programme. CIT has mobilized net fund of 117 billion 120 million as of January 14, 2019 in the fiscal year 2018/2019.